We have some fun videos out this week, including several on styling sliders and one on how the 'position' CSS property works - a tool that many of use use regularly but haven't taken the time to really suss out. 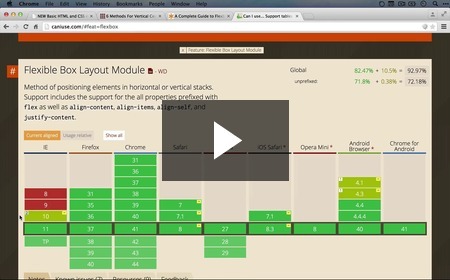 We also walk through what some of the new modules in Drupal 8 are for. What the "Core (Experimental)" section is for and how Inline Form Errors works New! In Drupal 8 there is a new group of experimental modules that are being worked into Drupal core but still have known bugs or an unstable API. 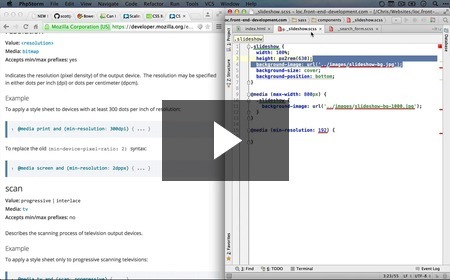 Here we talk about these modules and what one of the experimental modules is for. What the Migrate and Migrate Drupal modules are for New! The fact that the Migrate module ships with Drupal 8 is a huge win for those who might be looking to upgrade their Drupal 6 and Drupal 7 sites. In this video we explain what both the Migrate and Migrate Drupal modules are for and hopefully get you excited enough to give them a shot. Later on in this series we'll be demonstrating how these work in detail. How the Datetime, Link and Telephone modules work New! Formerly contributed modules, the Datetime, Link and Telephone modules supply HTML5 native fields that also get some robust server-side validation right in Drupal 8 core. What the "Web Services" modules are for New! Here we explain briefly what the "Web Services" group of modules is for and why you might still end up using the contributed Services module if you need to build a robust API for your project. 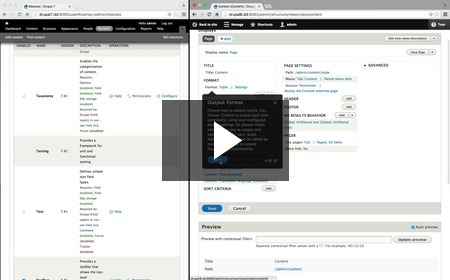 Comparing the "Site information" and "Cron" admin pages in Drupal 8 and Drupal 7 New! 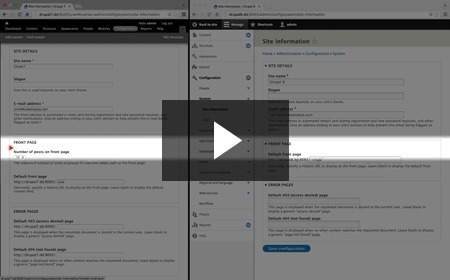 For the most part, the "Site information" and "Cron" configuration pages are the same, but in this video we work through the minor changes. 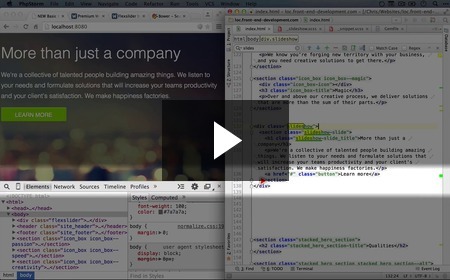 Merging our "slide" and "slideshow" components and refactoring our classes New! Earlier in this series we created a "slide" component to house some CSS that didn't belong anywhere else. 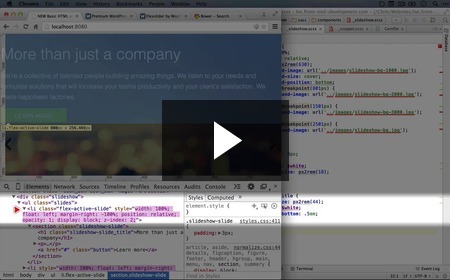 Now that we've created the "slideshow" component, it's looking like the slide CSS actually belongs in there. 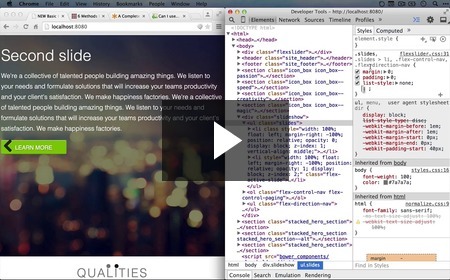 In this video we merge two components - something that you will likely find yourself doing again. How we will approach styling our circular, bordered images New! Here we summarize the styles that we'll need to get a nice circular image. Why we're using a background image for our circular images, and building out the basic CSS New! 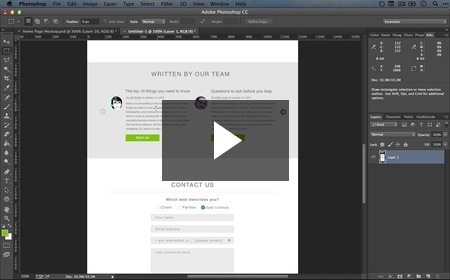 How to style a circular image with a border and drop shadow New! 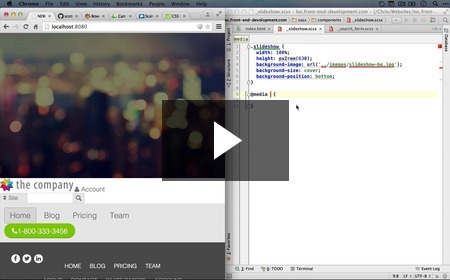 Here we build on the previous video and add some rounded corners, a border and a nice drop shadow to our author image. 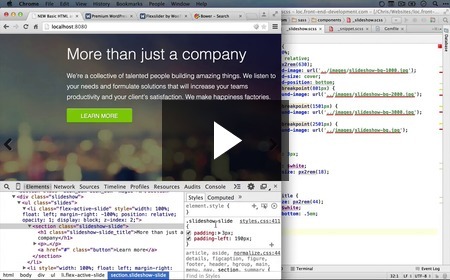 Adding our second image, and moving our snippet HTML to the right place New! For completeness sake, we add our second snippet image and move the whole HTML chunk to the component where it will live out it's HTML-y life. Is this starting to feel like a real web site yet? 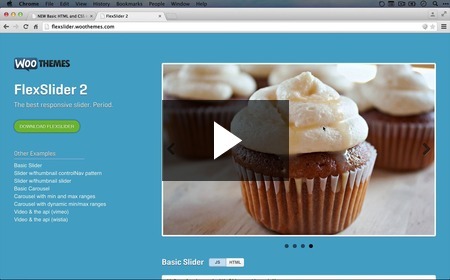 Reviewing what functionality we need for our slideshow sliders New! Our mockup doesn't move, but we can tell a lot about the implied functionality in our slideshows just by doing a bit of detective work. In this video we review the mockup and figure out what our requirements are going to be for our slideshows and what makes each slider unique. 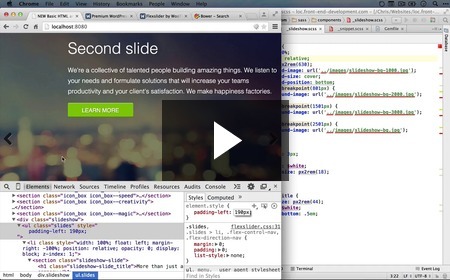 Overview of the "Flexslider" feature set and review of examples New! 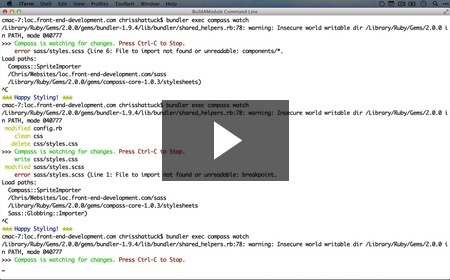 How to install Flexslider and add a working example New! 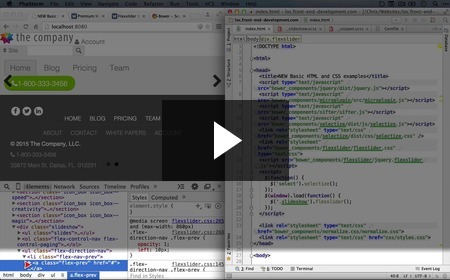 How to connect Flexslider to existing HTML to convert it to a slider New! 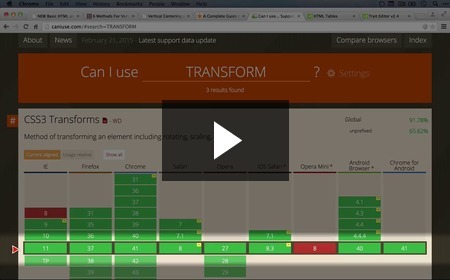 Tracking down why the Flexslider navigation does not appear over the slider New! After we attach Flexslider to our slideshow, we are able to see it working, but the navigation for the slideshow is in a totally unrelated place on the page. Here we start a drill-down to figure out what's going on. 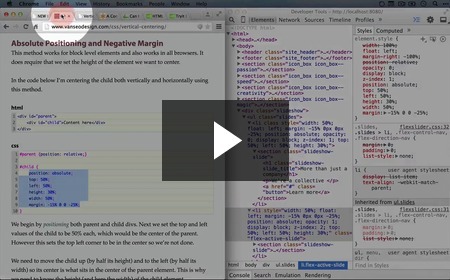 How the relative, absolute, static and fixed CSS "position" values work for element layout New! 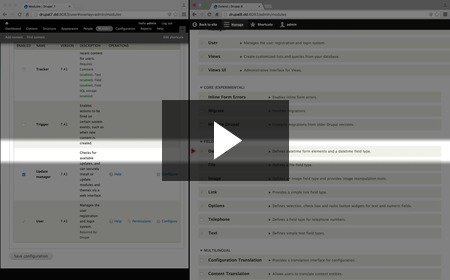 As we alluded to in the previous video, the problem with our Flexslider navigation not being positioned properly had to do with the default value of the CSS "position" attribute on our elements. 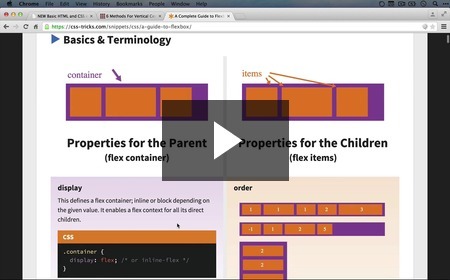 In this video we explore what is often a confounding but absolutely critical CSS property for layout, and how the different values work in relation to one another. 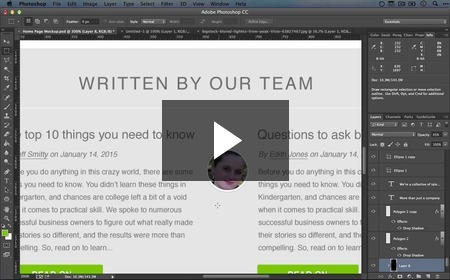 Why adding left padding to slides in our slideshow container doesn't work New! 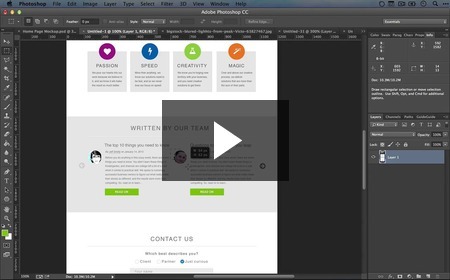 In this video we take a stab at getting the content in our slideshow to visually match the mockup. The first order of business is adding some padding to the left, and for very good reasons we try adding the padding to the slides instead of the slideshow container. By doing this, we witness first hand the difficulty in modifying the CSS of third-party libraries, and move on to another possible solution. 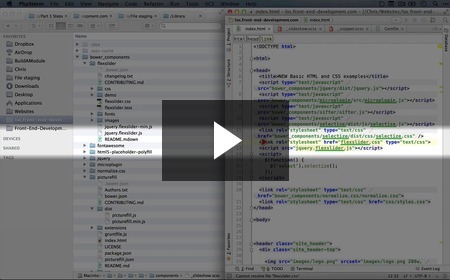 Solving our slideshow left padding issue by applying padding to the slideshow container New! 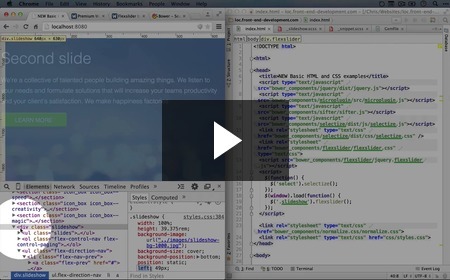 Setting the width of our slideshow slides New! 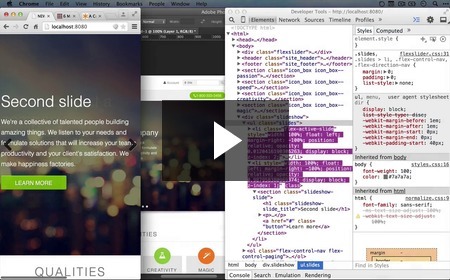 A discussion of options for vertically aligning our slideshow content New! We've had to vertically align numerous elements so far in this series, and in this video we discuss the how the possibilities we're familiar with might help us with the current task of vertically aligning our slides. This week we're releasing 20 new videos, 10 from the "Front End Development" collection and another 10 in "Upgrading to Drupal 8." In these we get to explore media queries and breakpoints and how many of the core modules in Drupal have changed from Drupal 7 to Drupal 8. 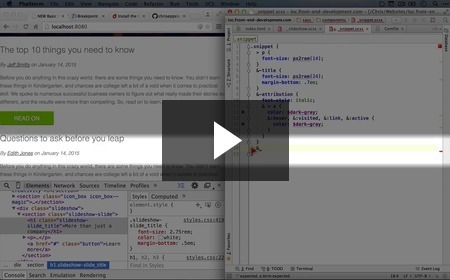 For those of you who are making the leap to Drupal 8, keep up the good work and I will continue to add new videos to help you get your bearings. 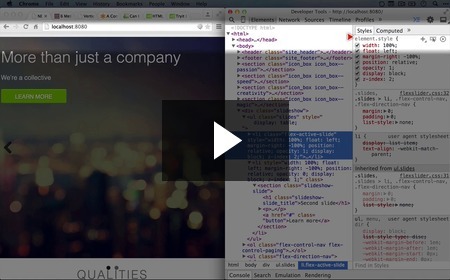 How to create a media query to swap background images based on the browser width New! Here we demonstrate how to switch which image gets used for the background of an element based on the width of the browser. Swapping CSS based on browser size is likely the most common use you'll find for media queries as a front end developer. 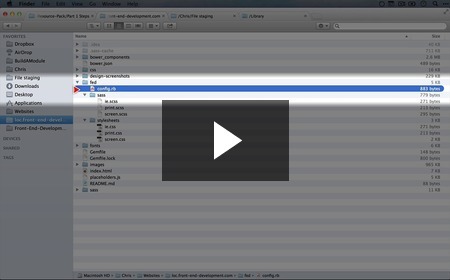 How to swap images with a media query based on screen resolution New! While we ultimately won't check the screen pixel density in our media queries, it's important to understand how to do it for possible future CSS adjustments. 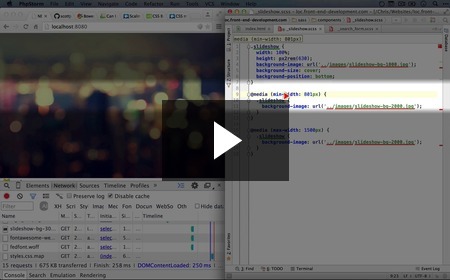 How to use "min-width" to set multiple breakpoints in your CSS based on browser width New! 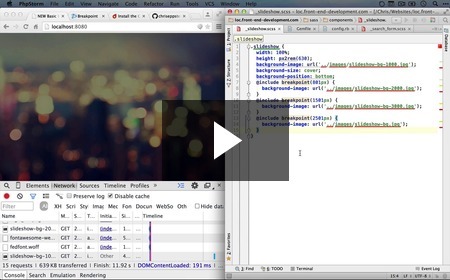 Earlier we set a media query using the "max-width" condition. There are definitely uses for "max-width," but we'll discover multiple reasons to use "min-width" instead as we move through this series. 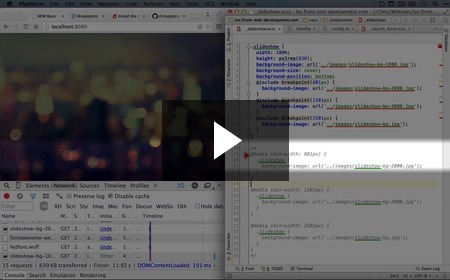 In this video we set up a series of media queries to serve up different background images based on the growing width of the browser window. How the SASS "breakpoint" extension works, and troubleshooting installation New! How to install Compass New! We've gone quite a ways through this series without needing Compass, and if you're crafty you could keep moving forward without it. 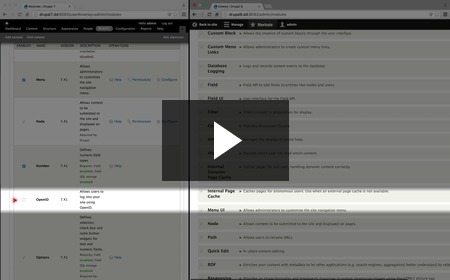 However, in order to use the "breakpoint" SASS extension, we're going to need Compass first, and so in this video we work through that process. 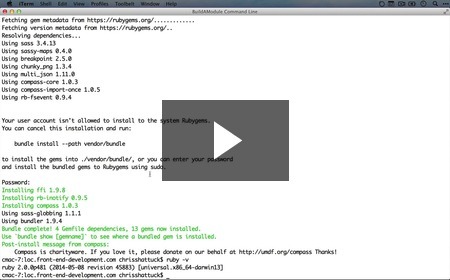 Encouragement for when you run into dependency issues with Ruby, node.js or Compass New! 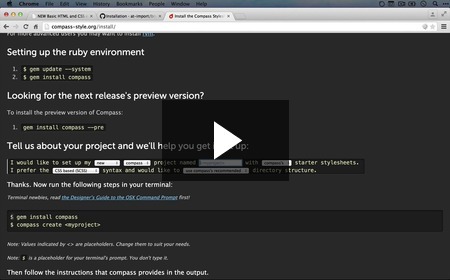 How to set up a Compass project New! Now that we've installed Compass, we have one more step before we can use it. 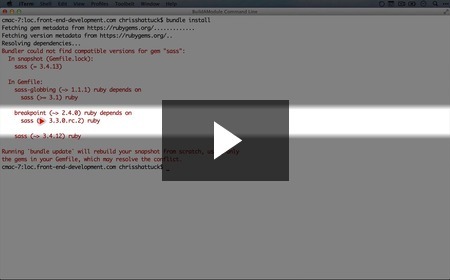 In this video we create a SASS project and set up some of the basic variables in our config.rb file. 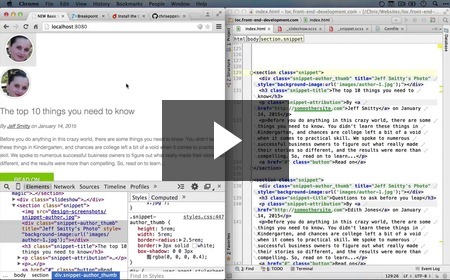 How to set up the breakpoint extension with Compass and use it to simplify our SASS New! Having installed Compass, we're now ready to use the breakpoint extension. Here we get it set up in our Compass configuration file and see first-hand how nice it is to bring some sanity to our media queries. Summary of why the "breakpoint" SASS extension is so useful New! 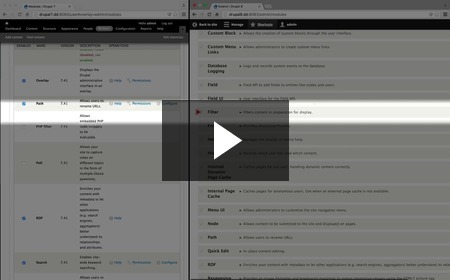 In this short and sweet video, we remind ourselves why we wanted to start using the breakpoint SASS extension in the first place. 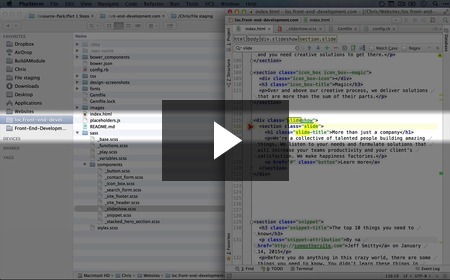 Summary of how many projects set up their media query breakpoints New! When we added our media queries to swap out our slideshow background image, we build our queries to roughly match the size of the images. Most projects, however, standardize on a handful of breakpoints and uses those to swap out images and other CSS. Here we briefly explain how this works. 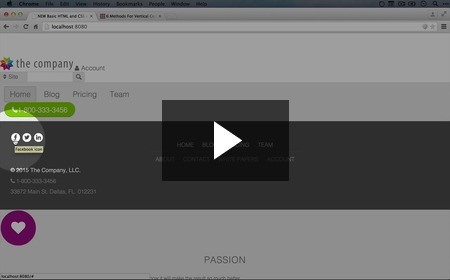 Changes to the Actions, Trigger, Tracker, Automated Cron, Ban and Blog modules New! From here we're going to work our way down the modules page and review each module that has moved, had a name change, be removed or added. That will eliminate a huge number of surprises as you work through the process of upgrading your own workflow to match Drupal 8. 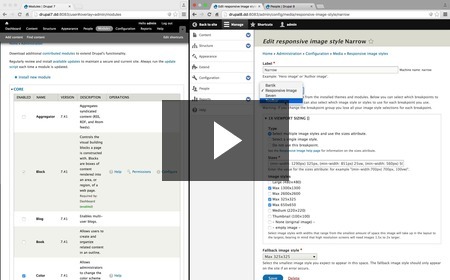 How the Breakpoint and Responsive Image modules work in Drupal 8 and how to view breakpoints in the UI New! 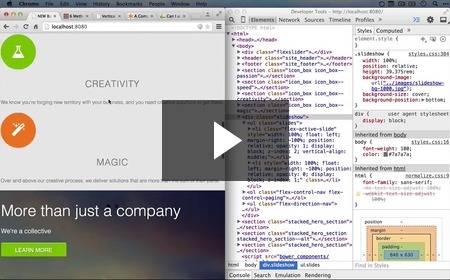 Both the Breakpoint and Responsive Image modules offer significant front end tools to developers. 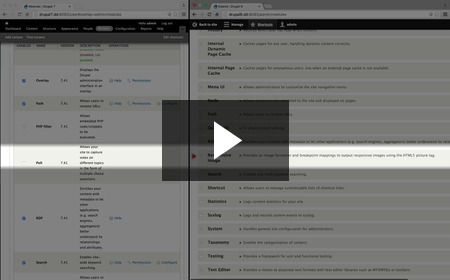 Breakpoints are difficult to centralize across the back and front ends, but the Breakpoint modules supplies an API to connect the two. Responsive Images are also deceptively tricky and the interface for managing them is intuitive and thoughtful. 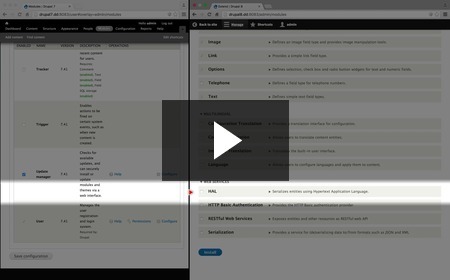 Here we walk through the basics of each and show how you can review global breakpoints supplies by modules and themes through the Responsive Image module. 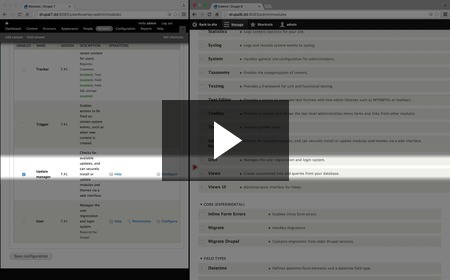 Changes to CKEditor, Configuration Manager, Custom Block and Dashboard on the module page New! The Dashboard module is gone in Drupal 8, but there's a number of concessionary modules that have been added to reduce the hurt. Changes to File, Image and List on the modules listing page New! Spoiler alert: The File and Image modules have been re-grouped under the "Fields" section, and the List module has been merged with the "Options" module. 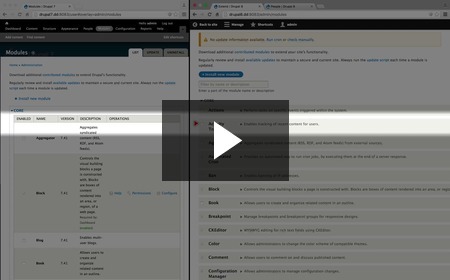 How multilingual modules have been adjusted on the modules listing page in Drupal 8 New! 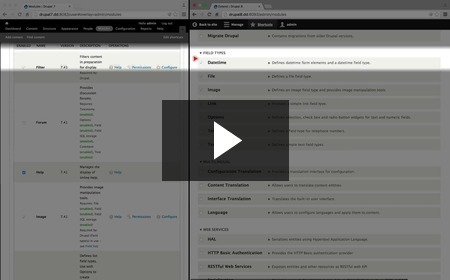 Later on in this series we'll demonstrate the workflow for translating the interface and content in both Drupal 7 and Drupal 8, but in this video we simply talk through how the modules from Drupal 7 have been adjusted and re-named in 8. Why the Open ID and Overlay modules were removed in Drupal 8 New! There may not be many tears shed over the removal of Open ID and Overlay, but just in case you're curious why they disappeared Drupal 8, we spend a minute explaining their departure. Why the PHP Filter module was removed in Drupal 8 New! Most developers will rejoice at the news that the PHP Filter module has been removed from Drupal core. It means fewer maintenance issues, easier migrations and a much lower risk of security holes spontaneously opening up. If you're one of those that will miss it - and I'm with you there - there's still a contributed module to give us the same feature. 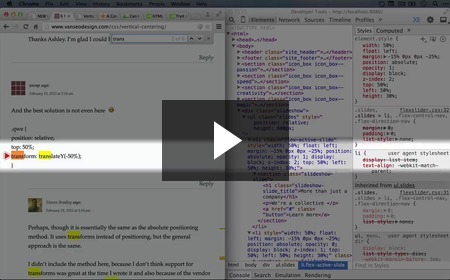 Why the Poll module was removed and what the Responsive Images and Text Editor modules do New! 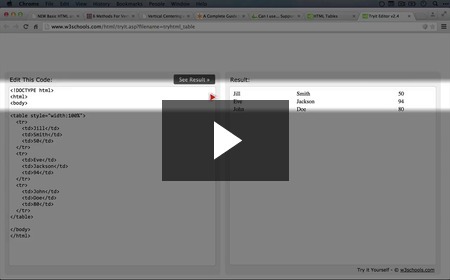 Demonstration of how the Tour module can provide contextual step-by-step help in overlays New! The difference between the Views and Views UI modules in Drupal 8 New!